The Dragon Tarot is a theme deck illustrated by fantasy artist Peter Pracownik and adeptly portrays dragons as symbols of knowledge and power while associating them in familiar tarot surroundings appropriate to each specific card. 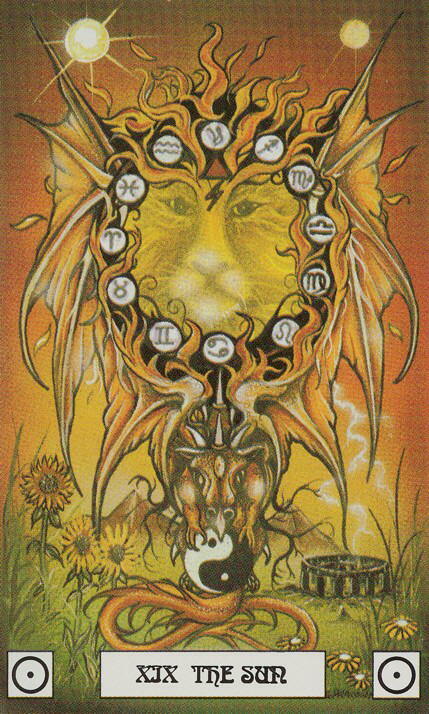 For the Sun card we see dragon wings surrounding an enflamed lion face around which are placed glyphs of the twelve signs of the zodiac. A horned dragon connects the celestial body to the ground as it clutches a Yin/Yang symbol.